The cast and crew of the New Melle Community Passion Play will present the story of the last days in the of Christ for the two weekends before Easter. Shows are Saturday, April 6 at 7:00 p.m., Sunday, April 7 at 2:00 and 4:30 p.m., Saturday, APril 13 at 7:00 p.m., and Sunday, April 14 at 2:00 & 4:30 p.m.
What began as a legacy of love by Mariam & Gene Steward has now, over 30 years later, become an annual labor of love by many who are involved in the production, as well as those who return every year to watch the portrayal. The volunteer actors, singers and people behind the scenes bring new twists and talents each year adding new life to the production. The New Melle Community Passion Play will be presented in the New Melle Sports & Recreation Center’s main building at 4700 Highway Z in New Melle. Please join us for one of these performances. It is a great family Easter event! Admission is a free will donation only. For additional information or large group reservations call Donna Curdt at 636-634-1150. 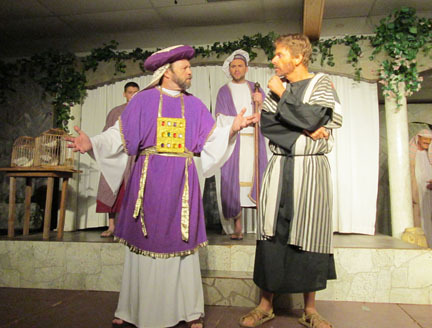 Follow the play on Facebook at “New Melle Community Passion Play”. "In this scene, Judas is conspiring with the High Priest to betray Jesus."